September 13, 2014 - The Diné Bizaad app seeks to provide a dictionary of Diné words and phrases including spoken word. Native Innovation, Inc. and the collaborators of this project have designed a unique way of promoting our Diné language. This project in it’s infancy was sometimes perceived as too ambitious, but the vision of Native Innovation, Inc. is to be just that - innovators and visionaries. 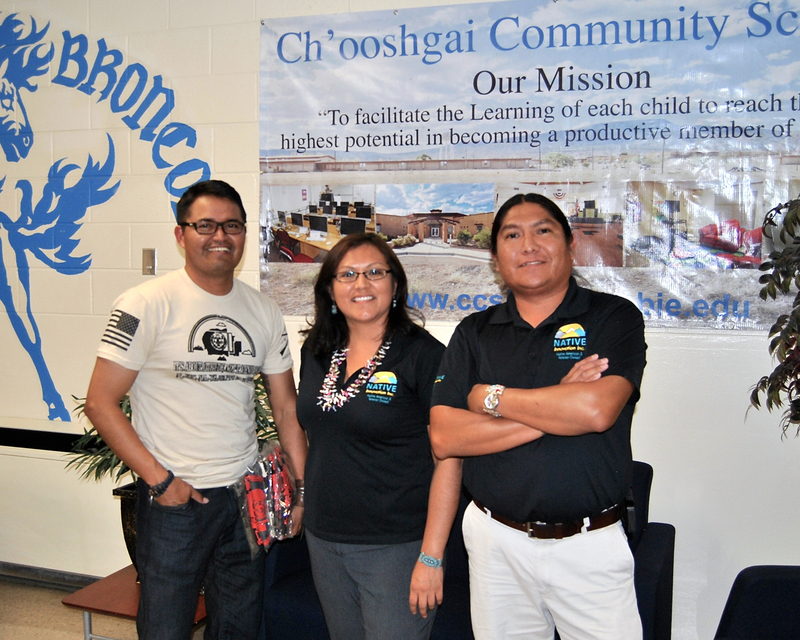 The Diné Bizaad app was originally developed January 2013 by Kialo Winters of Na’ Neelzhiin - Torreon, New Mexico. This concept began January 2013 with a blog called Diné Web 2.0 which promoted Diné language learning by seeing and hearing spoken word by searching through categories of situational Diné words and phrases. The idea was also to create a space on the World Wide Web for collaborators and contributors to add Diné language samples. The Diné Bizaad app was made available on September 13, 2014 in the iTunes® store. The Diné Keyboard layout founded in 2012 by Jerome Tsosie and Florian Johnson has been integrated into the Diné Bizaad app and naturally makes searching words/phrases work seamlessly. Kialo envisioned this language learning concept to be open source, with a community of Diné language enthusiasts contributing from anywhere around the world. In fact, this goal of community based sharing helped develop the move from a desktop browser to a mobile app design. The concept of crowdsourcing common Diné words and phrases allows us to input the regional variations of pronunciations and vocabularies spoken by our Diné people. The Diné Bizaad app has two parts, a Diné-English vocabulary and a English-Diné vocabulary. The English words and phrases are all associated to Diné words and phrases. The synonyms element and antonyms element are important principal parts in searching correct Diné word and phrase associations within the app. The Diné Bizaad app is to use the World Wide Web as a repository to perpetuate Diné language communication and education. We do this with an inclusive ensemble of Diné language enthusiasts, who continuously add content shared from Diné communities and from their personal contributions into the Diné Bizaad app repository. The first goal, education and the second, system management are goals stating what results the Diné Bizaad app will be. Since this is a mobile app, it’s difficult to measure the outcomes or return on investment and will have to go by local census and local language assessments, respectively. You will be able to read and hear, through spoken word, enunciated Diné letter consonants, diphthongs, glottal & nasal sounds and vowels. You will be able to identify self-help and intrinsic motivations to learn the Diné language through dialogue synchronously and asynchronously with friends, family and neighbors. You will be able to use this as a language learning tool that accompanies language curriculums in any formal education institutions. Native Innovation, Inc.: Jerome Tsosie, President, Sevaleah Begay-Tsosie, LaVelda Charley, Kialo Winters (Founder of Diné Bizaad app). Contributors: Freddie Johnson, Mildred Walters, Barsine Benally, Florian Johnson, Donovan Pete (Logo Designer), Lydell Rafael, Dee Yazzie, Alfredo Yazzie, Irvinson Jones, Terri Winters, Michelle Whitstone, and Randy Whitehair. 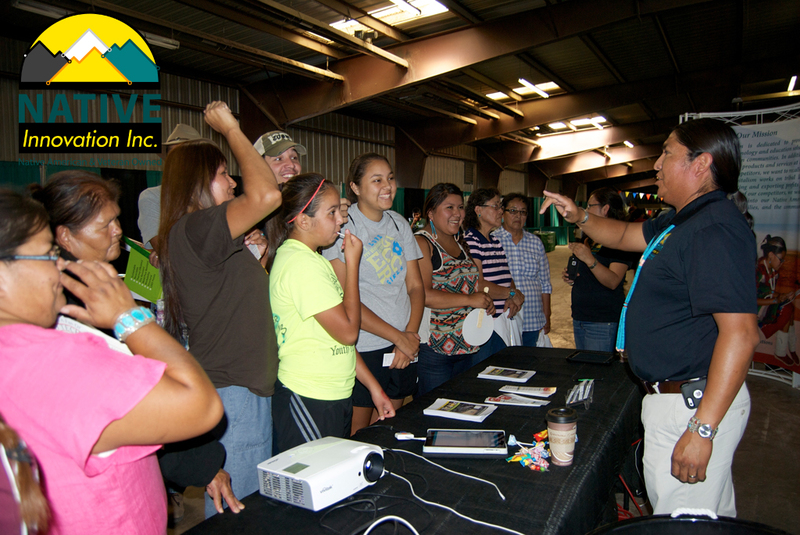 Kialo Winters presents the Diné Bizaad app for iPhone®, iPad® & iPod touch® at the 68th Annual Navajo Nation Fair. 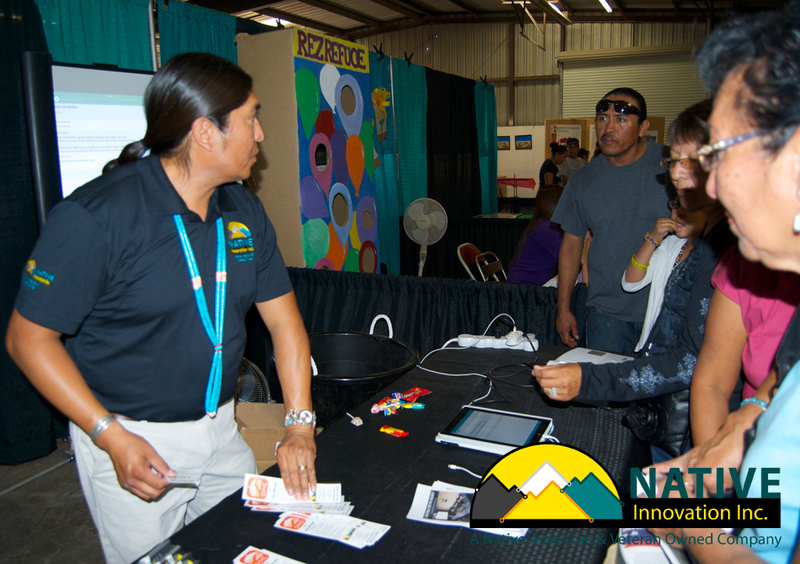 Kialo Winters presents the Diné Bizaad app for iPhone®, iPad® & iPod touch® at the 68th Annual Navajo Nation Fair. He guaranteed everyone would be high-fiving the Native Innovation crew after they saw what features were in the app. A father asks, "Did you just say FREE?" YES FREE!! EVERYONE HIGH-FIVED OUR NATIVE INNOVATION CREW. Diné Bizaad Baa Hózhǫ̨́. Our Diné Language Is Beautiful!